It is well known that the Pan Flute, or Panpipes, are named after the Greek god pan, but the reason why the panpipes are also known as the syrinx is probably less well known. In Greek mythology though, Syrinx was the name of a Naiad nymph, and there is a story about Syrinx and the creation of the panpipes. 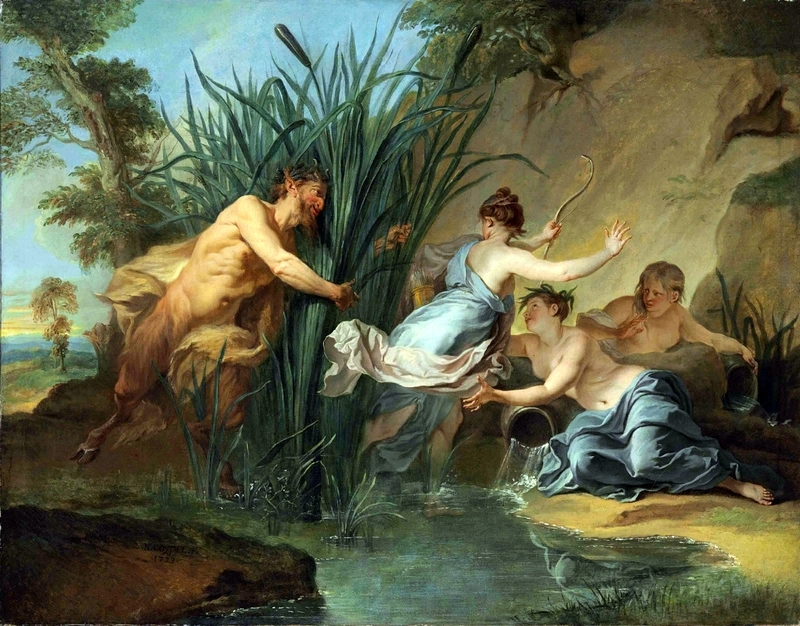 Syrinx was a Naiad nymph, the daughter of the Potamoi Ladon, and therefore sister to the likes of Daphne; and the story of Syrinx in Greek mythology is a similar one to Daphne. Syrinx was a follower of the goddess Artemis, and indeed looked similar to the goddess, and had many similar attributes, including being a good huntress. Syrinx had also decided to keep her virginity, just like Artemis. Syrinx was of course beautiful in appearance, as were all nymphs in Greek mythology, and this beauty ensured that gods and satyrs sought to have their way with her. Syrinx though was fleet of foot, and easily eluded her potential suitors. There was one god though was particular persistent in his pursuit of Syrinx, and that was the Greek god Pan. Syrinx found that Pan kept on following her, and eventually she was chased to the banks of the River Ladon. To keep her chastity, Syrinx called out to her sisters for help, and thus Syrinx was transformed into the reeds that are found so often by river banks. When Pan arrived at the spot where Syrinx had been, all Pan heard was the wind make music as it blew over the tops of the reeds. Recognising the reeds as the metamorphosed Syrinx, Pan cut away some of the reeds, cutting to different lengths, and then bound them together with wax, creating the panpipes, or syrinx. Pan now had Syrinx with him at all times.